Georgia's location in the U.S.
Heard County is a county located in the U.S. state of Georgia. As of the 2010 census, the population was 11,834. The county seat is Franklin. The county was created on December 22, 1830. 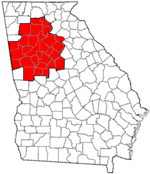 Heard County is included in the Atlanta-Sandy Springs-Roswell, GA Metropolitan Statistical Area. Heard County was created by Act of the Legislature on December 22, 1830. It was named for the Honorable Stephen Heard, elected President of the Council on February 18, 1781, thus, in the absence of Governor Howley, becoming Governor de facto. Heard moved to Wilkes County from Virginia and fought in the American Revolutionary War where he distinguished himself at Kettle Creek. The first Sheriff, Jonathan Mewsick, was commissioned in 1832. According to the U.S. Census Bureau, the county has a total area of 301 square miles (780 km2), of which 296 square miles (770 km2) is land and 5.1 square miles (13 km2) (1.7%) is water. As of the census of 2000, there were 11,012 people, 4,043 households, and 3,040 families residing in the county. The population density was 14/km² (37/sq mi). There were 4,512 housing units at an average density of 6/km² (15/sq mi). The racial makeup of the county was 87.48% White, 10.82% Black or African American, 0.32% Native American, 0.11% Asian, 0.07% Pacific Islander, 0.47% from other races, and 0.73% from two or more races. 1.05% of the population were Hispanic or Latino of any race. There were 4,043 households out of which 37.70% had children under the age of 18 living with them, 57.90% were married couples living together, 12.10% had a female householder with no husband present, and 24.80% were non-families. 21.30% of all households were made up of individuals and 8.70% had someone living alone who was 65 years of age or older. The average household size was 2.70 and the average family size was 3.12. In the county the population was spread out with 28.70% under the age of 18, 7.60% from 18 to 24, 30.70% from 25 to 44, 22.00% from 45 to 64, and 11.00% who were 65 years of age or older. The median age was 34 years. For every 100 females there were 96.50 males. For every 100 females age 18 and over, there were 94.10 males. The median income for a household in the county was $33,038, and the median income for a family was $39,306. Males had a median income of $31,900 versus $22,492 for females. The per capita income for the county was $15,132. About 10.50% of families and 13.60% of the population were below the poverty line, including 14.60% of those under age 18 and 17.40% of those age 65 or over. ^ a b "State & County QuickFacts". United States Census Bureau. http://quickfacts.census.gov/qfd/states/13/13149.html. Retrieved February 16, 2014. ^ Gannett, Henry (1905). The Origin of Certain Place Names in the United States. Govt. Print. Off.. pp. 153. http://books.google.com/books?id=9V1IAAAAMAAJ&pg=PA153#v=onepage&q&f=false. ^ "U.S. Decennial Census". United States Census Bureau. http://www.census.gov/prod/www/decennial.html. Retrieved June 23, 2014. ^ "Historical Census Browser". University of Virginia Library. http://mapserver.lib.virginia.edu. Retrieved June 23, 2014. ^ "Population of Counties by Decennial Census: 1900 to 1990". United States Census Bureau. http://www.census.gov/population/cencounts/ga190090.txt. Retrieved June 23, 2014. ^ "Census 2000 PHC-T-4. Ranking Tables for Counties: 1990 and 2000". United States Census Bureau. http://www.census.gov/population/www/cen2000/briefs/phc-t4/tables/tab02.pdf. Retrieved June 23, 2014. This page uses content from the English language Wikipedia. The original content was at Heard County, Georgia. The list of authors can be seen in the page history. As with this Familypedia wiki, the content of Wikipedia is available under the Creative Commons License.